Flat screen TV: Available as Plasma, LCD, LED or OLED, screen sizes can be as large as 152″ and display 3D content. 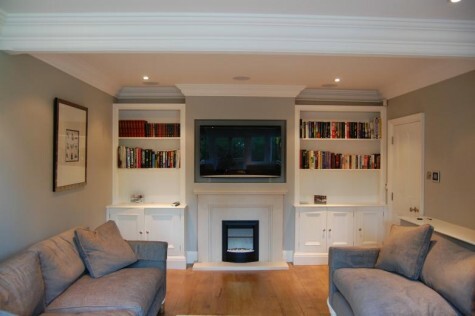 Screens would typically be wall mounted or could be concealed. Please see Flat Screen TV section for further details on concealing. Projector screen: A lot less expensive than plasma screens of the same size, projector screens offer a true home cinema experience and can come in different wide screen formats. Projector screens can be fixed flat to a wall, be manually or electrically brought down from a surface housing or be recessed in the ceiling. Projectors can offer huge screen sizes at affordable prices. They can be ceiling mounted, placed on a ‘table top’ or concealed in the ceiling on a motorised drop down mechanism. They can not only display your movies in glorious full HD but can also display other media such as a satellite box, laptop or photos. 3D projectors are also available. A typical home cinema speaker package is referred to as 5.1 which refers to the five speakers and the one subwoofer. There are AV Receivers available that can decode audio to 7.1, 9.1 and even 11.2 speaker packages. We can provide various speaker solutions such as in wall or in ceiling speakers or speakers can be wall mounted, standmount or large floorstanding speakers in various styles and finishes. Subwoofers can be also be in wall, in ceiling, wall mounted or floor standing. The speakers and subwoofer are typically powered by an AV Receiver which can also process the video. Components such as a Blu Ray player are then connected to the AV Receiver and housed in a piece of furniture or in a rack in a dedicated cupboard or comms room. Even if the components are hidden away out of sight, remote controls can be used to control all equipment either through radio frequency or infra-red receiver kits. Imagine being able to press “Watch movie” on your pre-programmed touch screen remote and the following happens: The lights dim, the projector screen drop down from of the ceiling, the projector is turned on and drops down from the ceiling, the AV Receiver is turned on to the correct input, the Blu Ray player is turned on and the movie starts. All with one push of a button! We can supply traditional cinema seats or luxury chairs with electrically operated leg and back rests which come in different coloured Italian leather finishes. They can also come with storage in the arm and even a refrigerated or heated cup holder. We can supply a wide range of AV racks, cabinets, TV stands and wall brackets to cater for any set up.